This is one of my favorite mystery series right now because I absolutely love the residents of Snowflake and Lucky’s restaurant, By the Spoonful. The relationships Lucky has in each book are very unique and interesting. I enjoy the character interaction and development in each book. Lucky has such a big heart and smart mind. I found A Roux of Revenge to be a very enjoyable page turner. The soup shop in this particular series, By the Spoonful, is by far one of my most favorite locations in all of the cozy mystery series. How much cozier can one get than a nice, warm, cozy soup restaurant in a town called Snowflake, Vermont! Archer spins a wonderful mystery that keeps you guessing until the end. I really adore this series and this book has me wanting more. Snowflake, Vermont, is known for its skiing in winter—and its soup all year round, thanks to Lucky Jamieson’s By the Spoonful. Autumn brings golden leaves, pumpkin rice soup, the annual Harvest Festival…and murder. Connie Archer is the national bestselling author of A Spoonful of Murder and A Broth of Betrayal, the soup lover’s mystery series set in Vermont, from Berkley Prime Crime. The third book in the series, A Roux of Revenge, will be released on April 1, 2014. Connie was born and raised in New England. She now lives on the other coast. When a band of travelers arrives in the village of Snowflake, Vermont and a dead stranger is found by the side of the road, the past returns with a vengeance. Long kept secrets will be revealed, lost loves will be found and the lives of many in the village will be irrevocably altered. 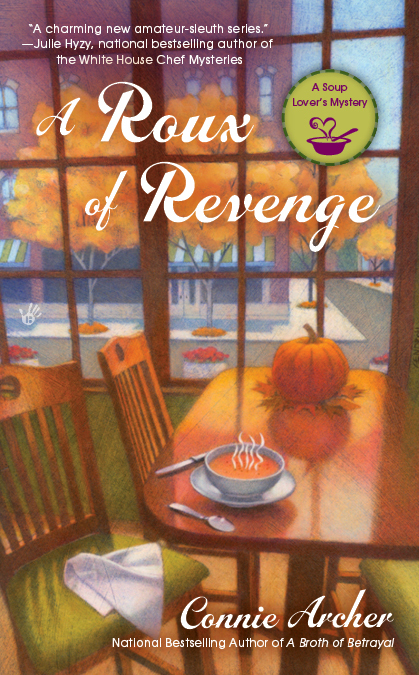 Special thanks to Deal Sharing Aunt for hosting this stop on my blog tour for A Roux of Revenge, the third book in the soup lover’s mystery series. There are many elements that create a story. Many disparate facts and fiction are woven together to make a tale. A Roux of Revenge casts its net over a wider area, not just the village of Snowflake, its inhabitants and its winter tourists who come for the skiing, but strangers and travelers who arrive from another place and speak a mysterious language. The village of Snowflake is hosting a Harvest Festival and one of the highlights of the Festival is a clan of travelers, a group of Scottish Gaelic-speaking musicians from Cape Breton. What brings these travelers to Snowflake, of all places? Granted, these musicians often make appearances at many summer and autumn festivals throughout Canada and New England, but Snowflake is special to them because, just outside of Snowflake, are the “Stones,” a megalithic structure the travelers believe was built by their long distant ancestors – a place that is sacred to them. In New England alone, there are hundreds of such sites, stones with markings in an unknown language and stone chambers that line up with the equinoxes and are said to predict eclipses. Inventing a megalith just outside of Snowflake wasn’t such a stretch after all. The early colonists of New England were confounded by these strange markings on stones. Their leaders sent enquiries to England hoping for more information, to no avail. No one could hazard a guess as to which people had made the marks or what they meant, but the fact remains that prehistoric markings and structures were here long before the first colonists and are still being studied. Many other sites have been found across the United States -- New Mexico, Arkansas, Iowa and Kentucky to name just a few places. Recognized experts didn’t, and some perhaps still don’t, acknowledge these sites and structures as dating back thousands of years. Students of prehistory had always been sent to Europe and to the Scandinavian and Baltic countries to study neolithic structures. Why did the so-called experts not want to acknowledge we had sites worth studying right here at home? In recent years a revolution in thinking has taken place, thanks in great part to a Harvard professor named Barry Fell and his book, America, B.C. Once the genie was out of the bottle, information poured in from people all over the country who were now sure the markings on rocks found on their properties were significant. 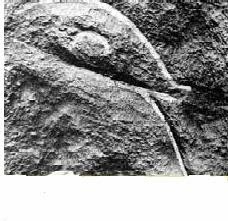 This carving is identified as the “Eye of Bel” and is found in many megalithic chambers throughout New Hampshire and Vermont. Its ogamic inscriptions have been translated as “Pay heed to Bel, his eye is the sun.” Bel, the ancient Keltic sun god is another incarnation of the Phoenician sun god Baal. 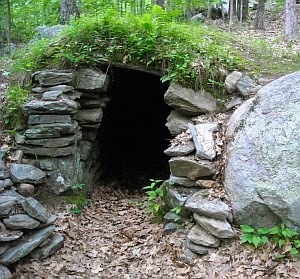 This is a chamber from the Gungywamp site in Groton, Connecticut. It was my inspiration for the Stones of Snowflake. My clan of Scottish Gaelic-speaking travelers considers the Stones of Snowflake a sacred site to which they are drawn every few years. And these Stones hold a well-hidden secret that will expose an old crime and a murderer. You can read more about the travelers and the Stones in A Roux of Revenge. And if you live in New England, take a good look around. You never know. You might find mysterious markings on rocks in your own back yard. In Connecticut we have Panera's, Panera's is a soup/sandwich restaurant. As I read through this book I could see some of these things happening while I was eating at Panera's. There is nothing better then a great bowl a soup! Especially if it is cold weather, or if you are sick. The recipes that were included in this book made me go out and get their ingredients as soon as I could. I loved that this book took place in New England. I am from Connecticut and also being a New Englander I can relate to the residents of Snowflake. I also really enjoyed reading about the Harvest get together and the Harvest decorating. Fall is my favorite season (October is my wedding month) and I wanted to go to Snowflake to join in the festivities. The mystery was also a good plot and I did not guess the killer until the answer was revealed. Snowflake is a small town, and the author did a fantastic job of creating memorable characters. Some of these characters seem like they moved to Vermont from my town! The romance was interesting because there was more involved then just what was going on in the book. It seemed that Lucky only thought about all the ways they were different and how their relationship could fail. There was a cliffhanger, and that cost this book its fifth star. I know that it is a series, however I like information about the next book in a series to be in an excerpt at the end of the book I am reading. The author did tie up the main plots nicely and I can not wait to read more from this author. I hope that a Christmas theme is coming soon! I am giving this book a 4/5. I was given a copy to review, however all opinions are my own. I would ask: What is her method for writing a murder mystery? There are so many characters, the plot, sub-plots, it is not an easy thing to do and, at the same time, keep the reader interested and confused to the end. Hi Lisa - that's a good question. I'm not really sure myself! I like to use post- it notes in different colors and spread them all over the biggest table in the house. One color is the main plot and other colors for subplots, etc. Then I can move things around as needed. It helps me not to get confused. Thanks for stopping by today and I hope you get to visit Snowflake soon! Megaliths, witch trials, the Romani people, soup and a terrific writer to boot! I can't marry Connie--we're both spoken for. But I can do the next best thing--and so can you--read her terrific books! BTW, yes, this is indeed a plug for Connie and, no, it wasn't solicited nor was it expected. So there! Oh wow! Thanks, Gary! You're truly a kindred soul, keyed into all sorts of arcane subjects as I am. Great to hear from you and thanks for the plug! Hi Ronna. - Most of them are just ones I've made up from things that are in the refrigerator, whatever happens to be around. Sometimes they're my versions of soups I've heard about or tried in restaurants. The hard part is recreating them so I can write down the recipes because I usually don't measure anything. I like to experiment. Of course some turn out much better than others! Thanks for stopping by today!